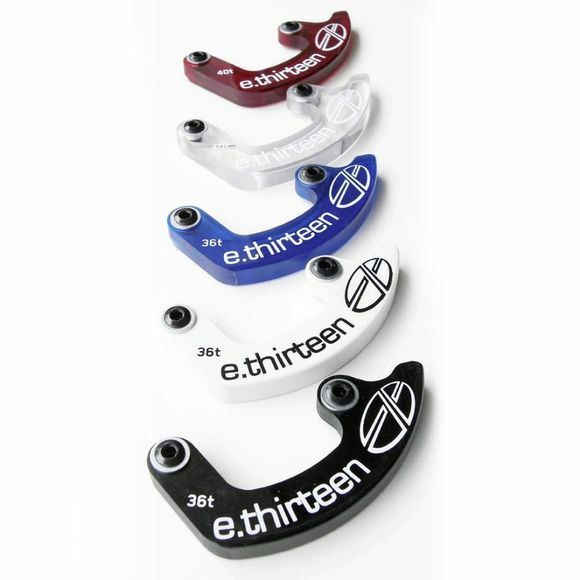 Over the past several years, e.thirteen has worked in secret along with some of the world's top riders to develop and refine their worldwide patent pending direct mount bashguard chainguide technology. After winning six (6!!) World Championships and being shaped through countless hours of analysis and testing, this new system is ready for release. The pioneering e.thirteen design attaches a "taco" bashguard directly to a chain retention system mounting plate. Eliminating the bashguard attached to the cranks reduces chain retention system weight, while offering the bash protection that racers need to compete. As of today, e.thirteen is the only company that currently has a public patent portfolio aimed at protecting direct mount bashguard chainguide technology. This innovative product was first made available in 2008 on complete bikes from a wide range of manufacturers, and as part of the lightweight and secure LG1 chain retention system.